← This Dinner Will Get You Laid – Slow Roast Duck for Chinese New Year, and a question; do you have a type? My husband and I are stalked by bagpipers. We go shopping in Edinburgh. There’s a bagpiper. We honeymoon in Paris. Bagpiper. Machu Picchu after three days hiking the Inca Trail. Bagpiper. And now, several blocks away, the dulcet tones of that weapon of war drift up to me as I type. It’s for Burn’s Night apparently. The bar is doing a whiskey and Burns Night special all week. After which, I’m assured, the piper will go away. Probably until St Patrick’s Day. In the mean time, I turn for solace in baking – Millionaire Shortbread, (from Jon’s Granny Hannah’s recipe) and flapjacks. Flapjacks are not cupcake glamorous. They’re not chocolate brownie indulgent. They’re not the kind of baking that garners accolades and cooing. But they are delicious. And this should not be underestimated. Also, they’re pretty hardy. Jon’s mum used to post us parcels of them when we were at University. They travel well. They’re a welcome low key gift for people who are going hiking, moving apartment, taking exams, bringing home a new baby, heading to Iowa for a family reunion. The very plainness of a flapjack hits the spot, nourishing and comforting without showing off. 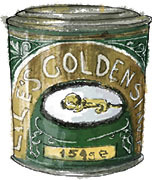 Just getting out the tin of golden syrup makes me feel nostalgic for the bake sales of my childhood. In go the oats and the dark, smoky demerera sugar. Such a lovely word. De ma re ra. My mum would serve it with coffee at dinner parties. “Katherine, can you fill up the sugar bowl with demerera?” then all alone in the dining room, I would stick my finger in and take a little lick. 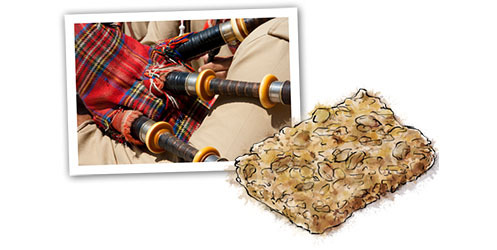 This entry was posted in The Monday Treat and tagged bagpipes, Burns Night, demerara sugar, flapjack, oats, syrup. Bookmark the permalink. Hi Katherine, I grew up in the Lake District (now in the Hudson Valley) and my Auntie Christine always ALWAYS had some in her cupboard. The recipe would never be the same twice as she threw in whatever was to hand. I’ve been feeling homesick lately so this is just the ticket! Quick question: What size pan do you use? I’m so glad you found this blog then! I have an Aunty Christine too who’s a great baker.